Find My Workspace lists over 95% of the business centres market in Tunbridge Wells. Simply click Request Quote to check pricing for one office, or Add to Basket for multiple offices. This centre provides flexible and cost effective workspace tailored to creative sector freelancers, remote workers, start-ups and small businesses. It is a focal point for creatives within the Tunbridge Wells area, actively promoting co-working between members through regular networking events, meet-ups and monthly socials. The House Creative Hub is made up of 14 rooms with over 50 desk spaces and a hot desk area. Shared areas include a meeting/venue space and a large decked garden with seating and table tennis table. There is also a well equipped kitchen with coffee machine, microwave, fridge and dishwasher, toilets include Ladies, Gents and Accessible facilities. A brand new centre that offers any potential new tenants a vast amount of space and the option to customise any offices to a design that they feel is appropriate. There are three smaller offices that can hold up to five people and a larger one that would be suitable for 15. As a result this is a centre that could be suitable for growing start up and established companies. The centre aims to support all the businesses that it houses and on site staff keep the site up to date and refurbished so business can continue stress free. All the available offices are well lit with modern lighting and neatly carpeted. there is the availability of an interior office and the glass walls offer a more spacious feel. 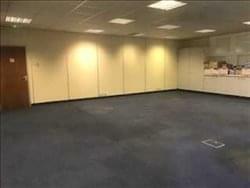 These offices would be suitable for a number of different companies and there is the option for flexible terms and leases.